Inspector Irene Huss of the Violent Crimes Unit in Göteborg, Sweden, is having a bad month. Per Lindström, leader of Gothia MC, claims no knowledge of why his man was there or who could’ve done it. “‘So I come back from my well-earned vacation and walk straight into a case involving the worse criminal elements in Göteborg!’” is Detective Inspector Jonny Blom’s reaction, but before long he and the rest of the members of the department will have more to worry about than a single death. A few days later, Irene’s husband’s car is bombed. No one is hurt, but Krister holds himself responsible. Then question is: Why would someone want to kill the law-abiding owner of a restaurant? Unless they got the wrong car? Jan-Erik, the former owner of Glady’s, also owned a car of the same make and color. Krister had recently bought the restaurant from him. At the moment, Janne is out of town, ostensibly on a trip to Marjorca with his girlfriend. The trouble with that is that Janne’s girlfriend is still working at their new restaurant, and the police have discovered a flight booked to Miami in Janne’s name. An unclaimed ticket. In rapid succession, a witness is beaten in a supposedly “home invasion,” Danny Mara, leader of the Gangster Lions—Gothia MC’s rival—is killed at a “family gathering,” and a wounded gang member is gunned down in his hospital bed with Irene as a witness. By now, the Organized Crimes Unit has joined Irene’s group because there’s definitely a connection between the deaths and the gangs. When Jan-Erik’s body is discovered inside a burning car, Krister admits to Irene he knows why. When Superintendent Tommy Perrson admits his department can’t guarantee her family’s safety because “we’re crap when it comes to protecting anyone under threat. We have neither the time nor the resources,” quick-witted Irene has a plan. Krister and the girls must leave town, not telling her where they’re going. Irene takes refuge in Tommy’s home, coming and going secretly but even that subterfuge is soon discovered, making them realize there’s a leak in the department. One of their fellow officers is giving information to the gangs. 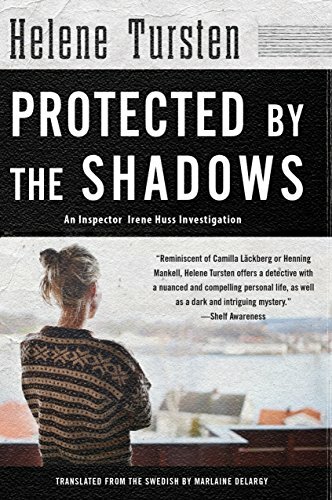 Like the previous novel, Who Watcheth, Protected by the Shadows gives a detail account of the efforts of the Swedish crime unit as well as the efficiency of their CSI in investigating the crimes. It’s interesting to contrast this with the procedures U.S. readers are familiar with through television series and movies. Since part of this narrative is concerned with Irene’s family and keeping them safe from gang retribution, there’s more characterization and personal information than usual, as in Irene’s relationship to Tommy, and the resurrection of the friendship she’s let die because of her work. Irene’s worry because she has no idea where her husband and daughters actually are is well portrayed. Tommy’s admission that the police can’t protect Irene’s family is a revelation that cutbacks in law-enforcement agencies don’t occur just in the US, and makes the Superintendent all too human. Though a reader may consider there’s a little too much going on with so many deaths and incidents, this is also a real-life look into the way a police department is run. Crime doesn’t stand still and wait for one case to be solved before another takes place, but runs simultaneously. In this particular one of Irene’s caseload, the crimes have a single starting point, and working backwards, brings this to light. This tenth installment in the series is a terrifying look into the life of a police officer more personally involved in a case than she’d like to be. It’s been noted this is the final installment of the series. Time will tell about that, for Irene Huss and her adventures are critically acclaimed.